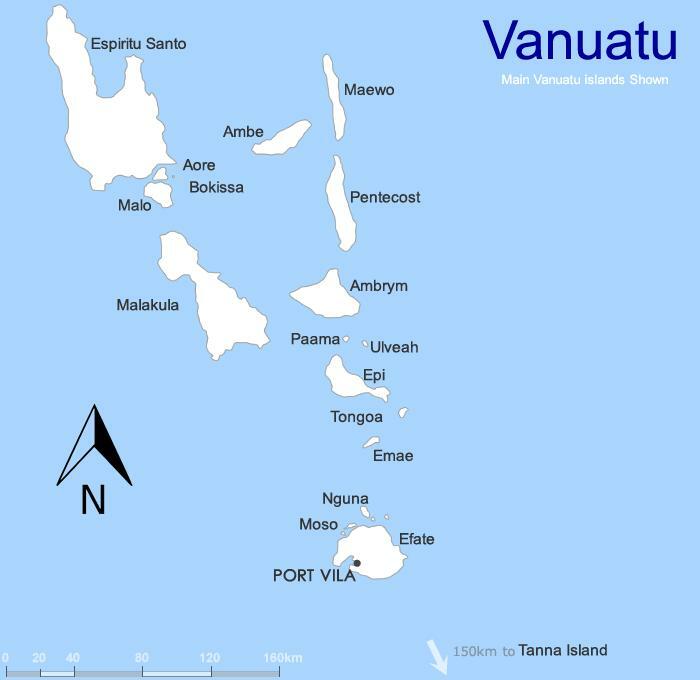 This Vanuatu map shows the majority of the islands that span 1300km north to south which make up the country. Port Vila is the largest city in Vanuatu and is also the county's capital. The city is also the commercial and economic capital of the country. Close to the city is Bauerfield International Airport. Not only is Port Vila a tourism focal point but it still remains an important centre for fishing and agriculture. Bislama is the every day language of the locals with English and French also widely spoken. The nearby island of Tanna is home to Mount Yasur, one of the most accessible active volcanoes in the world. The last major erruption occured in 1945. Because of its volcanic nature many of the islands in Vanuatu are steep with the highest point being Mount Tabwemasana standing at just under 1900m from the island of Espiritu Santo.